When it comes to interior design, homeware, baking and being super cosy, the Scandinavians do it best! 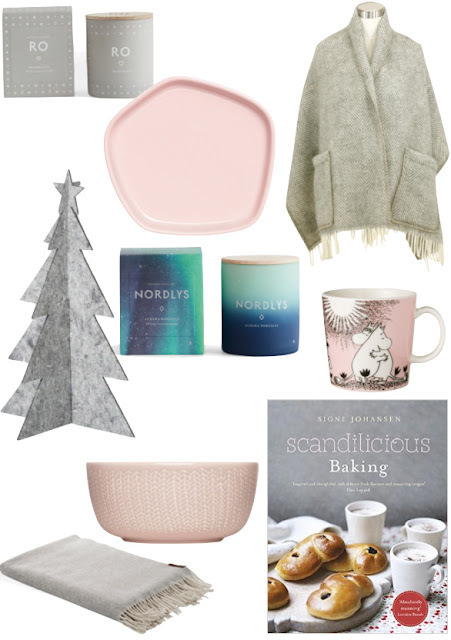 I love Scandinavian homeware, furniture, design, culture, baking and decor as well as the idea of hygge which I'm all for as it involves coziness, baking, spending time with friends and generally just being happy and comfy *yes, yes and yes* so here's my Scandinavian and hygge inspired wish list which is very appropriate today as it's been snowing! I love all of the items in this post, especially the heavenly Nordlys candle which looks so beautiful and the word Nordlys means Northern Lights in Norwegian; The second candle is from the same brand and it's the tranquility candle. I've made one Scandinavian recipe before (Finish Pulla Bread) which I adore so I definitely want to make some more gorgeous Scandinavian bakes! The throw and shawl would be perfect as I'm writing this as they are made from wool and the throw also contains cashmere so they would be really cosy and soft. This is a sponsored post. What do you think of the items I've featured in my wish list? Do you like Scandinavian homeware/design? The Moomin mug is the cutest. I love the simplicity of the items on your wish list and the pink & grey colour palette. OMG that shawl looks so cozy. I need it in my life! The throw and the shawl look so comfy. I also just love the whole colour scheme you´ve got going on in this wish list! I might be a bigger fan of Scandinavian interior than I ever thought I´d be!